First released in 1986, the American Gold Eagle coin is a joy to behold. Made of 91% gold, the coin is issued in denominations of 1/10 oz, 1/4 oz, 1/2 oz and 1 oz. 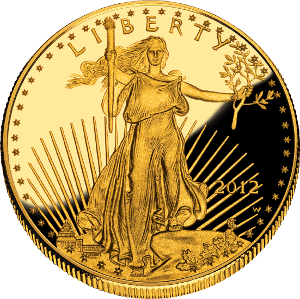 Artist Augustus Saint-Gaudens and sculptor Miley Busiek both contributed to the coin; Saint-Gaudens’ epic rendition of Lady Liberty is on the front, and Busiek’s portrayal of a family of bald eagles is on the back. The American Gold Eagle proof coin is the limited-edition version of this coin, and can also be purchased for physical possession or to place into a Precious Metals IRA.